Submerging Markets™ : Haiti: At Least "There's Partners in Health"
Haiti: At Least "There's Partners in Health"
PIH Clinic, near Camp Jean-Louis Vincent, in downtown Paup, 5/11/10. 50,000 people, 15K kids, in this camp alone. Just 2-3k are in school. 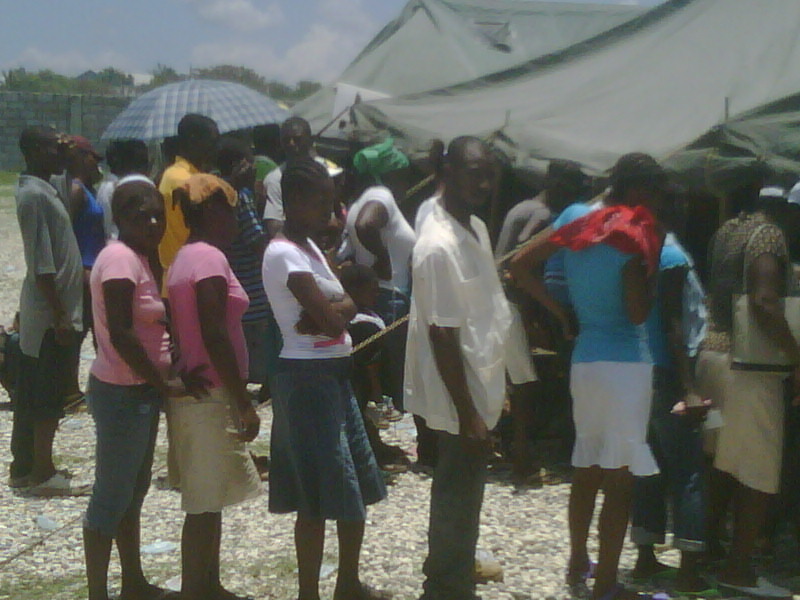 Haitian gov has stopped free food distribution to the camp since March 31. PIH estimates 40-50 % are hungry. Last week alone its new nutrition center I'd 107 kids with malnutrition, included 40 seriously malnourished. PIH now has 4 such clinics in Paup, 11 more in the central plateau, where its efforts started in the mid-1980s. Last year, before the quake, its $25 mm budget was 2x the entire Haitian gov's Ministry of Health budget. This year, it will spend $40 mm here, supporting more than 5500 community health workers, more than 200 haitian doctors and nurses, the country's only community mental health services, and 100 foreign volunteers. Meanwhile, the GOH continues to fall down on the job. Last week it finally managed to pay some of the doctors and nurses on staff at HUEH gen hospital for the first time since Nov. Its own outpatience clinics, mobile medical services, and mental health service are virtually non-existent; there are only 9 publc health psychiatrists in the entire country, and conditions at the badly-damaged mental hospital in Paup are zoo-like. Of course the food distribution calamity noted above -- a concession to the country's private food vendors, big and small -- is a triumph of brutilitarianism over humanity.